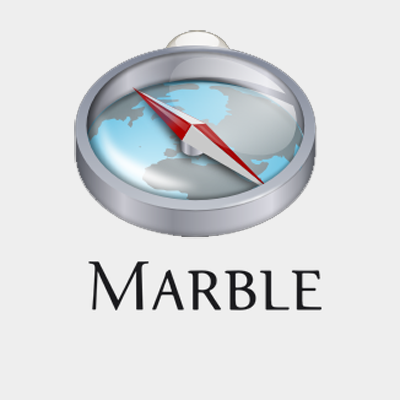 Marble is a virtual globe that allows the user to choose among the Earth, the Moon, Venus, Mars and other planets. It is free software under the terms of the GNU LGPL, developed by KDE for use on personal computers and smart phones running a Qt4-compatible operating system. Marble is intended to be very flexible; beyond its cross-platform design, the core components can easily be integrated into other programs. Marble is designed to run without the need for hardware acceleration, but it can be extended to use OpenGL. An important user-experience objective being that the application start fairly quickly, it ships with a minimal but useful off-line dataset (5–10MB).